Now that we’re two weeks into the month of January, I think it’s safe to say that the holiday season has (finally) come to an end. How was your festive season? Was it a pleasant one? Did you have lots of fun, with many opportunities to merry-make? But…there’s nothing quite as capable of spoiling fun times like the difficult morning after having one-drink-too-many during one of those merry-making opportunities. I am sure you know just what I am talking about … that nasty little thing called … a hangover. Anyone who has ever drank any alcohol surely knows what I am talking about. For those who don’t, lucky you! In that case, you’re not missing out. For all my readers who have had hangovers before, what do you do when alcohol gets the better of you and leaves you feeling fuzzy-headed and suffering from a number of horrible hangover symptoms, each worse than the next? For me, I usually flush my system with loads and loads of water in hope that the alcohol passes through my body as quickly as possible. Sometimes, when my hangover occurs on a day when I have nothing pressing to do, and when I am in the mood to hang out, I follow my system flush with a light alcoholic beverage (after midday, of course 😉 ) in true “hair of the dog” style. Still, a hangover is never a pleasant thing by any stretch of the imagination. Wouldn’t it be wonderful if there existed a pill which would allow you to skip the hangover? Well, apparently, a pill now exists that claims to do just that! 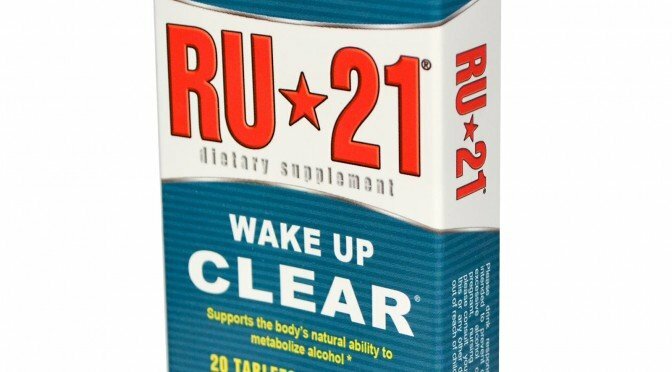 The miracle pill, RU-21, is an all-natural supplement made up of monosodium glutamate, a couple of acids, vitamin C and glucose that is to be taken while drinking—one pill per drink. 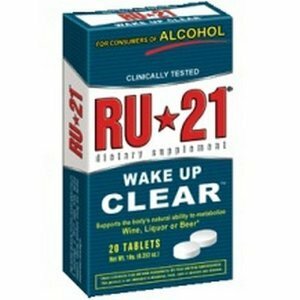 RU-21 does not affect levels of inebriation at all—so this pill will not help you feel less drunk—rather, RU-21 helps the body to process alcohol better, preventing the build-up of the toxic byproducts of alcohol metabolism, which is what causes you a hangover. Well, I can’t say for sure—I have never tried it myself—but here are some reviews I found on the net (here and here) written by people who have tried the supplement. The consensus is that RU-21 is effective in the case of moderate drinking but not as effective for heavy drinking (for that, I guess you still have to pay the price 🙂 ). Can RU-21 be found in Nairobi? I first heard of RU-21 from a poster at The Hood, ages ago! Somehow, I never thought the product was locally available and figured that the poster was up just for decoration (sort of like what happens at sports bars). It wasn’t until I found myself at Fifi’s, a bar at USIU where RU-21 is actually sold, that I understood that the product was for real and could be purchased locally. Could it be that RU-21 is also sold at The Hood, hence the poster? For now, all I wanted to do was to share with you that there might be a miracle pill, locally available, that can help circumvent hangovers when alcohol gets the better of you. Might any of you, my readers, have had any experience with this pill? If so, how did you first hear about it? Did it work for you? Where did you purchase your supply of RU-21? Tell all, tell all. Hi, my name is Lisa Taylor and I’m with the company Spirit Sciences USA, Inc., the makers of RU-21. Thank you for a fair and honest review of our product. While it is locally available in some areas, you still get the best deal when buying it directly from our website http://www.ru21.com. You can also call (310)568-1030. Thank you all, stay helathy and don’t drink and drive!!! Thanks for your feedback. Quick question for you: do you deliver to Africa? At what cost? The countries I am particularly interested in are Tanzania, Uganda, Kenya, Rwanda, and Burundi. I look forward to receiving more information from you soon! We can deliver, but the delivery cost is high and the package tracking mechanisms are poor. We had a distributor in Kenya who was doing a great job up until some recent unrests and economic slow down. He may still have product supply and I can get his info for you. Please let me know if you’re interested. Thanks for your feedback. I am not interested personally, but if some of my readers want to try your product, it’d be good to know where they could get it locally. Maybe you could give me the ex-distributor’s name here so that they’d be able to contact him. Is Kenya the only country in East Africa where you product is available? stronger so my crazy friends ? Ha ! I wish I could tell you about a wonder cure for the real heavy hangies, but alas, I know of none. Nice to see you on ChickAboutTown! Yeah, wouldn’t this pill be a godsend? Please when you find it in Kla, make note so that we can rely on it the next time we do a mega hang – coz si we still have to make up for Dec 8? Hehehehe….More on email.